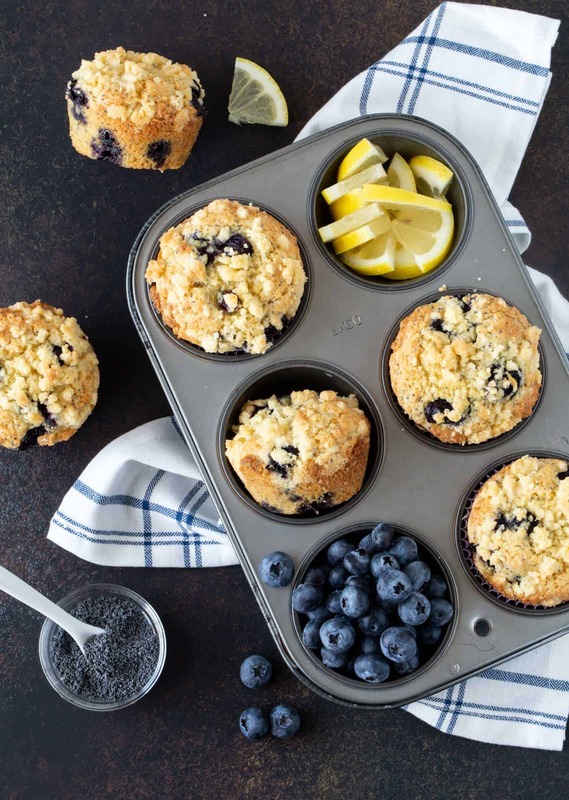 This muffin mashup combines the best flavors of lemon poppy seed and blueberry muffin recipes. 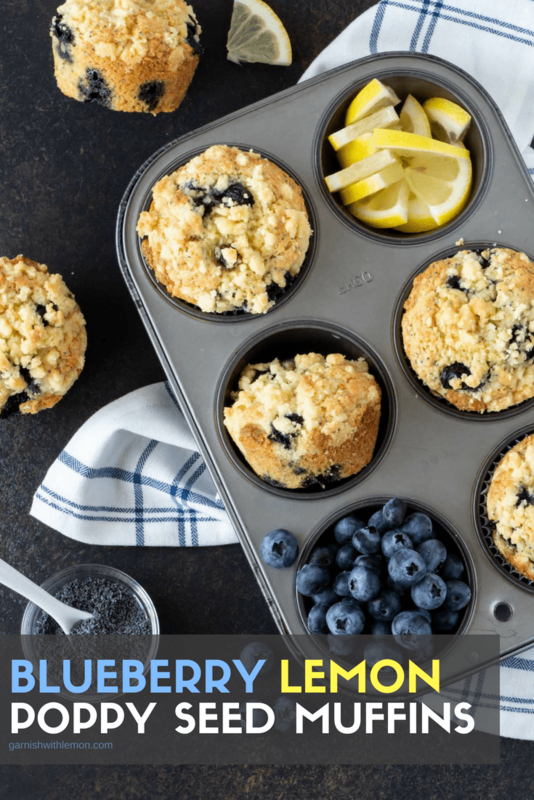 Make a batch of these Blueberry Lemon Poppy Seed Muffins with a crunchy streusel topping for brunch or for easy breakfasts on the go! Blueberry muffins need little introduction. What’s not to love? They’re a crowd favorite at nearly any gathering. But what happens when you combine a regular blueberry muffin with a lemon poppy seed variety? Whoa…crazy things are happening now! These Blueberry Lemon Poppy Seed Muffins are the absolute best of both worlds. You have juicy berries, tender cake and sweet crumb topping in harmony with the bright, zesty lemon flavor and poppy seed crunch. I say this is near muffin perfection. Muffins with a streusel topping are often called “bakery-style”. You can add a streusel or crumb topping to almost any muffin recipe if you love that crunchy muffin top. Streusel toppings are made by combining flour, sugar and butter and sprinkling the crumbs on top of the batter before baking. 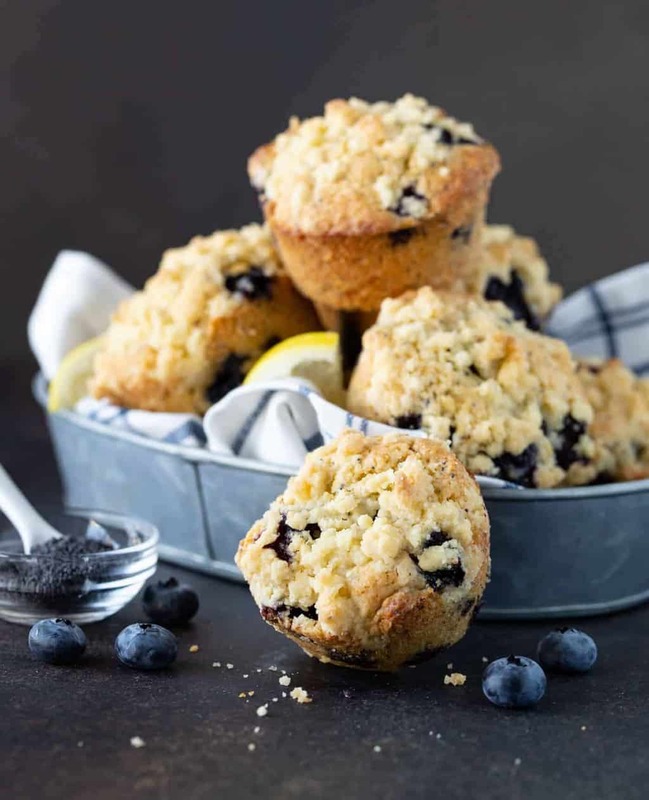 It adds the perfect amount of crunch to every bite of these Blueberry Lemon Poppy Seed Muffins. If you’ve made muffins before, you know how easy they are to throw together. There is one extra step in this recipe that I think makes these Blueberry Lemon Poppy Seed Muffins stand apart from others: you brown the butter before you combine it with the other wet ingredients. The result is a richer, deeper base that helps balance the strong lemon and delicate berry flavors. Pure deliciousness. Can I freeze Blueberry Lemon Poppy Seed Muffins? Absolutely! Pop these Blueberry Lemon Poppy Seed Muffins into a freezer bag or airtight plastic container. Most frozen muffins should be consumed within a month of freezing, but if you want to keep them longer (up to three months), double wrap the muffins individually to ward off any freezer burn. I love to make these muffins after our annual trip to the blueberry farm. There is nothing better than juicy, sweet, fresh-picked berries. But never fear, these muffins are just as tasty when made with frozen berries. Just don’t thaw them before using. Pull them straight from the freezer and stir them into the batter. These USA Pans are THE BEST. I have an entire set, and the muffin pan never disappoints. I have nearly every size of these stainless steel scoops. This one portions out just the right amount of batter for each well in my muffin pan. This microplane grater makes quick work of zesting your lemons. Preheat the oven to 375 degrees. Spray the muffin plan with cooking spray or place muffin liners in the pan. Melt the butter in a small saucepan over medium low heat. Stick close to the stove. Once all of the water has cooked out of the butter, it will brown quickly. When it is a medium brown color, remove it from the stove and pour it into another bowl to stop the cooking. Cool slightly. Add milk, egg, yolk and vanilla to a medium bowl and whisk together. Slowly pour in the cooled brown butter and whisk again until it is combined. In another medium bowl, add 1 cup all-purpose flour, 1/2 cup whole wheat flour, 3/4 cup sugar, baking powder and salt. Whisk to combine. Pour the milk mixture into the flour mixture all at once and stir gently to combine. Carefully stir in the lemon zest, poppy seeds and blueberries. Divide batter among muffin cups. Combine 3 tablespoons diced butter, 1/2 cup whole wheat flour and 3 tablespoons sugar in a small bow. Use two knives or a pastry blender to cut the butter into the flour and sugar. It should resemble small peas. Sprinkle topping evenly over muffins. Bake for 18 - 20 minutes until tops are golden and a skewer inserted into the center of the muffins comes out clean. Cool pan on a wire rack for 15 minutes. Remove muffins from pan and continue to cool on a wire rack. If using frozen berries, do not defrost them before tossing them in the batter. Oh yum, your muffins look and sound delicious! So right. What is not to love about a classic like this! I love lemon with blueberry too. Poppy seeds are one of my favorite muffin ingredients. Love that you added them to yours! I agree; poppy seeds are underrated. Love the crunchy bite they add to foods! The lemon-blueberry combo is my absolute favorite for muffins. These look delicious! Hard to beat those two together, Becca. Thanks for stopping by!